It is now better for the government to borrow from your Provident Fund (PF) than to use bond markets. In total, the government needs to borrow about Rs. 605,000 cr. They usually load this more in the first half, and borrow very little in the second half (basically the last two months see very little borrowing). Issue more in the short and long term segment of the bond curve. Currently the most liquid security happens to be the 10 year, but they’re trying to push for more on the 2 and 5 year zones too. What Does This Small Saving Thing Mean? Well, the government is currently paying more than 7.7% to borrow money for the longer term. This can be frightfully expensive – remember, interest payments are the largest expenditure of the government, much more than defense or subsidies or the like! So what you save as PPF or NSCs or other such mechanisms is now getting lower interest than the government has to pay for issuing bonds. (PPF is at 7.6%) Money has been flowing into PPF and such schemes – mostly because people prefer to park money there rather than keep fixed deposits at banks, where longer term interest rates are much lower. This money is now available for the government to use – around Rs. 100,000 cr. of it – rather than having to use the bond market. But it’s the same thing really – you give a bank your money, and they go buy government bonds. At least this way you cut out the bank from the middle. 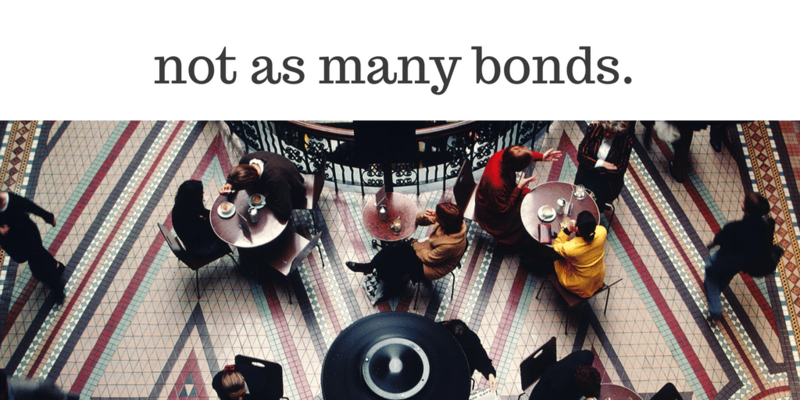 Government issued bonds are huge – over 51,00,000 cr. are outstanding, and they all mature at various points. 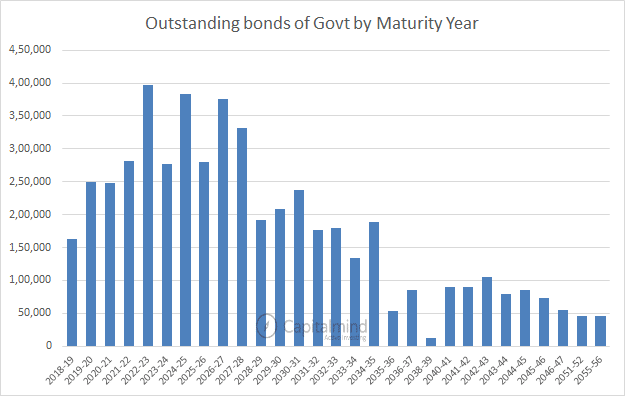 A relatively large amount of bonds start to mature after 2022 to about 2028, upto nearly 400,000 cr. for each year. These will hurt because effectively the government will need to refinance them and also issue new bonds in these years. Foreign investors LOVE our bonds. They have limits – they are allowed to own less than 6% of the government bond market. And they have 96% of their limits taken. Further, they also have 99% of their limits in the corporate bond markets too. That limit is likely to change – and go higher – after April 1, 2018. The additional liquidity should help bonds by increasing demand. Bond yields have been going up since October 2017. This move might temporarily provide some relief. Lower borrowing in the next six months, opening up for foreign buyers and using floating rate bonds might actually sooth market expectations. However, remember that US bonds yields are rising. And rising sharply. The US 10 year bond is at 2.83%, up from 2.06% six months ago. The 3 month USD LIBOR – a benchmark for a large number of floating rate loans – has nearly doubled in the last year from 1.2% to 2.2% now. With world rates going up, India tends to see a higher rate expectation anyhow. If world yields go up, we will go up too. Also, there’s a big issue: How is the central government going to recapitalize PSU Banks? It was suppose to give them over Rs. 80,000 cr. – and all that is supposed to come through issue of bonds. Are these bonds tradeable? If they are, banks will want to sell them, which increases supply and therefore will cause bond prices to fall. Will these bond qualify for SLR? Banks have to keep 19% of their deposits in government bonds. If the new bonds qualify, the banks will then sell the old bonds they currently have, thus depressing bond prices. And then, the government will have to borrow more later. They’ll just have to do more in the last half of the year, we think. The answer to those questions will determine the short term nature of bond yields. Remember that banks own a truckload of government bonds. Probably around 30 lakh crores of them. Bond prices have fallen 2-3% in the last three months, has a huge impact on bank bottom lines. A respite will help them, even if it’s temporary. And hey, it’s gonna be the end of March. When all banks will mark their balance sheets. So a lower yield – meaning a higher bond price – will help all banks report better numbers. In banking terms, that means the situation is going to change from horrible, to slightly less horrible.